As early as 1937, scholars were speculating about the role of television in education, their first hopes that it could be revolutionary dissolving into disappointment that TV had become, according to FCC chair Newton Minow in 1961, a “vast wasteland.” It wasn’t until November of 1969, when the Children’s Television Workshop launched Sesame Street, that the educational potential of television was clearly demonstrated. We learned from that experience not to become overly optimistic about the educational potential of a new technology, such as virtual reality, at least early on. Undoubtedly, like television, VR’s primary applications will always be in entertainment. But the TV experience has also shown that important educational benefits will likely be found, and this time sooner rather than later. Could the educational benefit justify the expense of building a VR/AR/motion capture lab at a school such as Bethany Lutheran College? The most immediate benefit would be to the growing number of students in Media Arts and Communication studies. VR applications are mushrooming in many areas including sports broadcasting, engineering, marketing, real estate, medicine, education, and others. According to JobsEQ, graduates specializing in Multimedia Technology can look forward to jobs with an average salary that was over $60,000 in 2016. Experience with VR, built on Bethany’s liberal-arts-oriented education, might push that number higher. Imagine a Bethany graduate heading out into job interviews with a VR component in her portfolio! But other majors could benefit as well, with VR enhancing intellectual exploration, interaction, and experience. Activity in a VR lab could prompt unique intellectual exploration. In my field, Communication, for example, story-telling would be impacted by a new narrative paradigm; VR would require graduating from the traditional Teller-Listener approach to a “Builder-Participator” storytelling paradigm, leading to deeper explorations of relationships between creators (“storytellers”) and audiences – new dimensions in “rhetoric.” I expect VR could raise similarly intriguing questions in other disciplines, not least of them the field of ethics. The Christ in Media Institute has long stressed the necessity of teams in video production – the need not only for “tech people” but for writers, business managers, historians, sociologists, psychologists, theologians, researchers in all academic areas, and especially those with the faith convictions Bethany represents. Imagine the learning that can happen in many disciplines when designing an accurate depiction of a virtual world set in Africa, or in the 19th century, or in ancient Greece or Palestine. VR offers the potential for student interactions otherwise difficult or impossible, thereby bringing to life experiences otherwise not available. Virtual travel can provide virtual situations – for example, as Ruth Reynard wrote in Campus Technology last year (April 26, 2017), “allowing teachers in training to observe classrooms virtually, giving environmentalists a virtual view of the devastation of forested regions, or letting sociology students experience human and social poverty around the world.” Since virtual spaces can be shared with others, students might interact with residents from those areas, even if they are physically in different locations. Finally, VR enables students to gain hands-on experience in unique ways. This is especially useful when difficult and risky training experiences can be safely and more inexpensively done in VR. Bethany doesn’t have a program in military or police tactics – areas in which virtual experiences can be invaluable in training. But our nursing program might take advantage of VR to experience certain risky medical situations. Along with those in athletic training, our student nurses could experience and practice training protocols more realistically but at low risk using VR. These are only a few ideas. Are you a teacher? 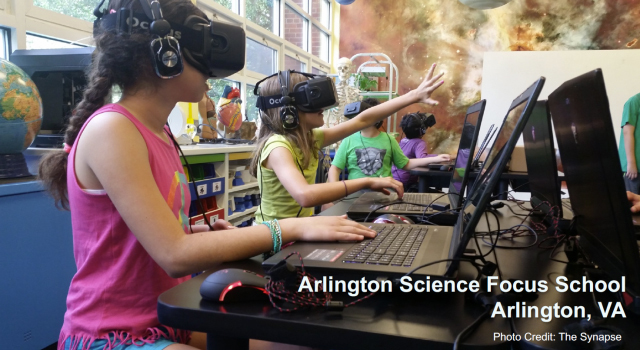 How might you imagine virtual reality could engage your students in your discipline in new ways?